She’s someone who’s loved by so many, especially you. 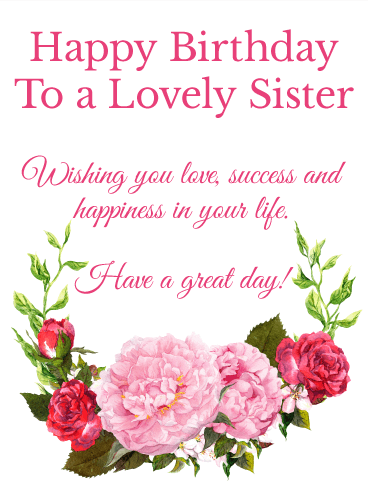 So help celebrate your sister on her birthday with this lovely card. A pale yellow background is embellished by a branch of pink flowers spiraling around. This charming design helps accentuate the meaningful words, which will remind her that on this special day, you are thinking of her and sending lots of wishes her way. 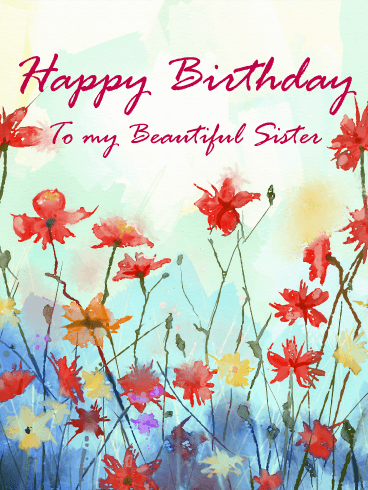 A beautiful floral background brings an extra special touch to this birthday card for your sister. Adding to the sentimentality of this greeting is the heartfelt message. It’s a chance to let her know that with each passing year, your wish for her remains the same: to be surrounded by all wonderful things—because she means everything to you. Sweet daisies set against a blue sky background is a beautiful way to celebrate your sister on her birthday. Filled with a touching message letting her know how much sunshine & joy she brings into your life, it's a chance to remind her that this day is for her and she should take every opportunity to enjoy all the love & happiness that surrounds her. When something bad happens, your sister is the person you turn to. She will rant on your behalf, hold you when you cry, and do her best to cheer you up when you need it. And you return the favor. You are each others' support and good time, the voice that encourages the other to indulge in delicacies. Today, shower your sister in love. Make her birthday the best day possible. Pamper her. She deserves nothing less on her birthday. Be it by sliding over a drink or telling you a really bad joke, your sister has the special power to wipe your stress away. She knows what makes you happy and uses that knowledge well. Bring that same sense of relaxed joy to your sister on her birthday. Soothe her frown lines, brush away her concerns. Let her birthday be filled with nothing but happiness because she knows you will always be there for her. You may roll your eyes at your sister twelve times a day. Shake your fist in her direction. Sigh in aggravation. But when it comes down to it, she lifts up your mood more than she drags it down. 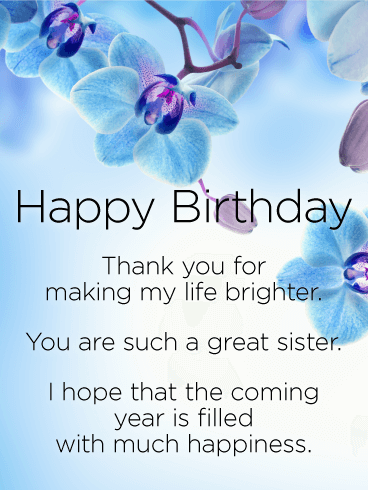 So brighten your sister's birthday. Let her know that even though you can't celebrate together in person, you're still with her where it matters - the heart. 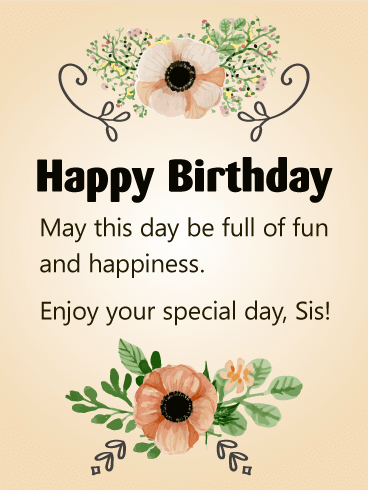 Wish your sister a cheerful day that can match her smile for her birthday. Nothing is too good for your sister. 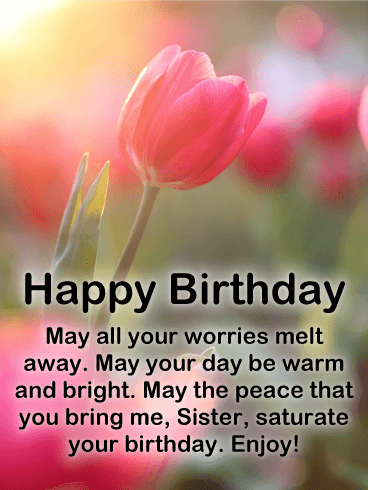 Wish your darling sister more laughter, beauty and love than her heart can hold this birthday. This pretty watercolor birthday card for a dear sister cannot be beat. The affectionate birthday message is made more meaningful by the beautiful, soft flowers painted in the background. 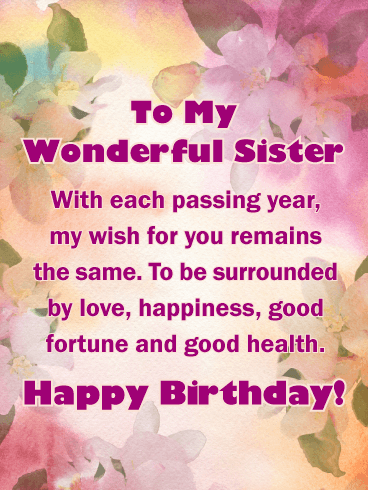 This lovely birthday greeting card will add smiles upon smiles to your sister’s special day. A mug full of tiny daisies is a special birthday treat! 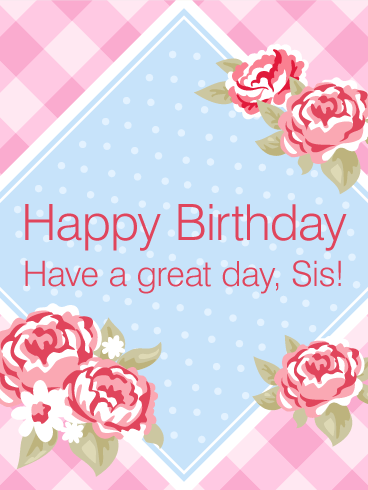 Send your sister this charming birthday greeting card on her special day. Your sister will adore the simple beauty and grace of these flowers, and smile at the warm message of love. 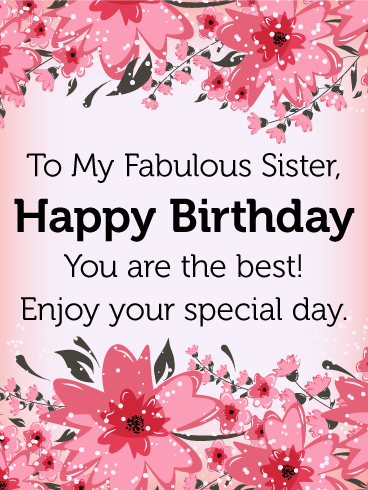 Let your sister know you are thinking of her on her birthday, and send this wonderful birthday card today! If you would like to thank your darling sister for being so wonderful and wish her success and lots of fun, then look no future! 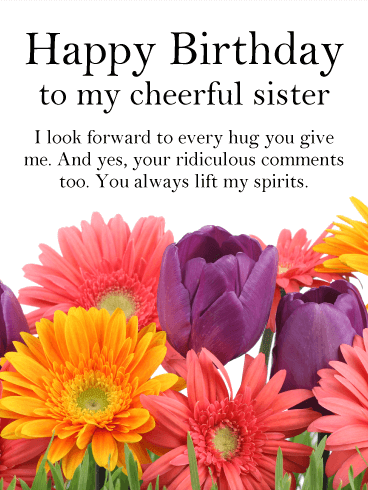 This birthday card will accomplish that and also put a smile on your sister's face. This beautiful birthday card was designed perfectly with bright pink roses, a special gift that features a purple ribbon, and creative Happy Birthday lettering. They all come together to create a birthday card your sister will love receiving! Birthdays are perfect for telling your family how much they mean to you, and this birthday card will let you do this in style. 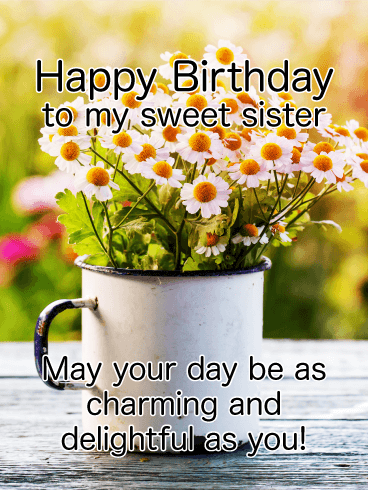 It features a spectacular purse made of flowers, fancy Happy Birthday lettering, and a special message that will make your sister very happy on her birthday. Who could ask for more! 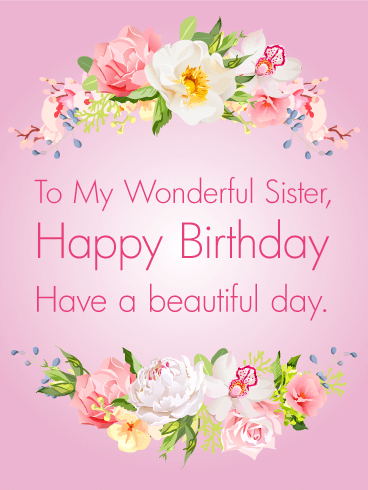 Wish your sister an amazingly beautiful birthday with this unique greeting card that will make your sister feel special! 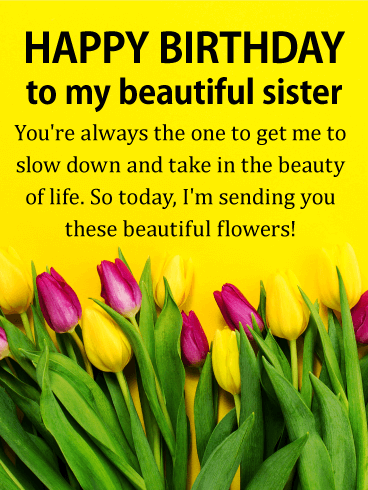 Everyone loves receiving flowers for their birthday, so you can't go wrong by sending this wonderful birthday card to your sister! The flowers look perfect and the green decorative vase make them look even better! Your sister will be so thankful you sent them her way. 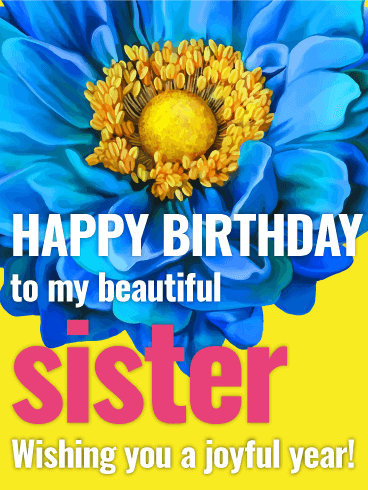 Wish your sister the beautiful day she deserves, and let her know you love her by getting this colorful birthday card over to her on her special day! 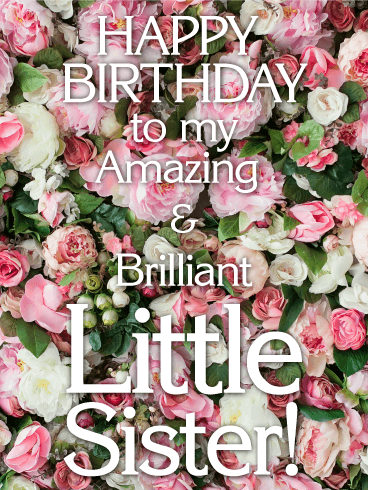 Send this gorgeous birthday card to your sister for her special day, she will absolutely love it! The flowers are beautifully painted with lovely colors that add a touch of elegance to this birthday card. The fancy lettering and decorative banner are the final touches that make this birthday card so exquisite. 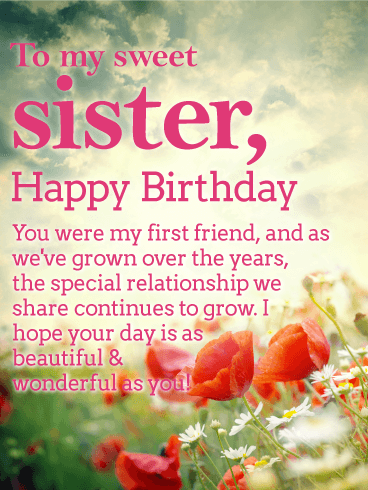 Send this birthday card to your sister, it will let her know you are thinking of her on her birthday. This birthday card is sure to take your sister back to your childhood days, especially with the old-fashioned bicycle and handlebar basket. It's unlike anything else out there. This birthday card is the perfect balance of adorable and sentimental, with the roses adding a delicate touch. 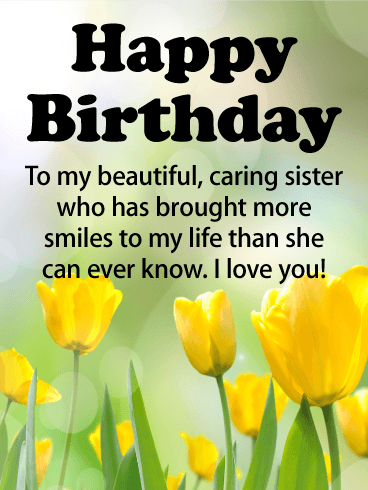 Wish your sister a birthday filled with love and happiness with this stunning, heartfelt birthday card. 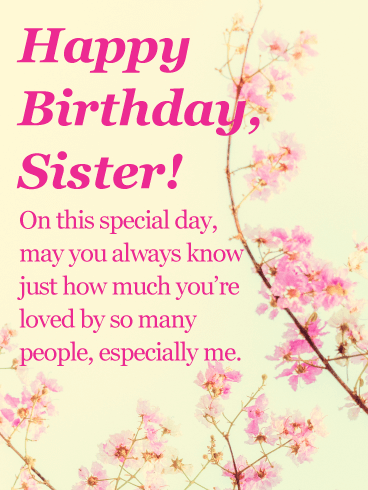 Have you been struggling to find the words to share with your sister on her birthday? We've got you covered. This birthday card is everything you've been searching for. The background picture is simple but stunning, the flowers add a heartfelt element, and, best of all, the words are perfect. 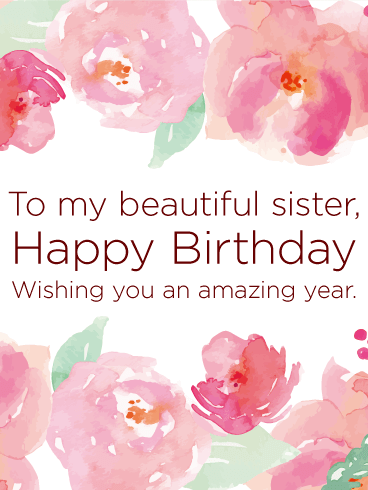 Show your sister how much she means to you with this winning birthday card. If you've been struggling to find a way to wish your wonderful sister a happy birthday, this is the birthday card you've been searching for. The abstract background makes this a truly artistic masterpiece, while the gorgeous flowers really take this card to the next level. If words aren't your strong suit, let this wonderful birthday card do the talking. Wish your sister a happy birthday with this birthday card featuring purple, pink, and white hydrangea intertwined with purple morning glory on a white background. A bluebird sings his song for best wishes and a happy birthday. Sometimes sisters are like the mothers we never had. They step in when we need them and teach us how to be the people we were destined to become. 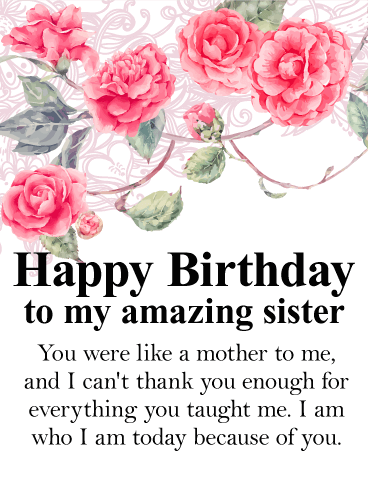 On this, your sister's birthday, tell her how thankful you are for everything she did for you. This birthday card is designed with a spray of roses over lace on a white background. Yellow tulips bring a smile to any face, and on your sister's birthday they are sure to make her beam. Make your sister as happy as she's made you with this birthday card. It features a field of yellow tulips on a natural light green background and a message telling her what she’s meant to you. When the world has you down, your sister can always show you the joy in it's simplest beauty. From watching clouds to cooing over new blossoms, your sister highlights all that is beautiful in the world. 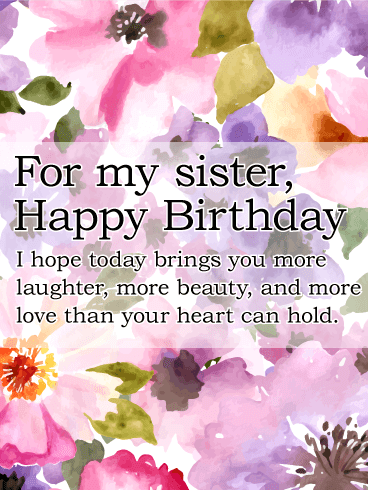 On her birthday, let your sister know the most beautiful thing in the world is her kind heart. From the thorny fights born of sibling rivalry to the velvety petals of sisterly support, every moment you spend with your sister had planted roots in your mind and grown. On her birthday, tell your sister how important, how engrained she is in your life. Without her, you wouldn’t be the person you are. And that makes your sister the most amazing person in the world. 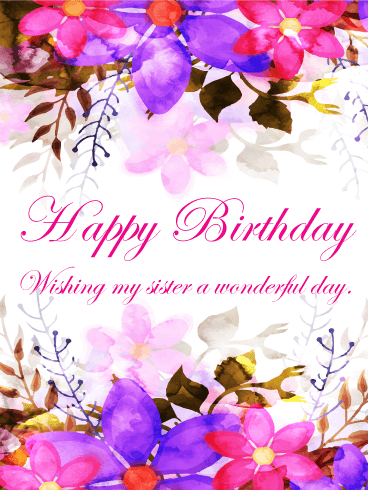 Wish your sister a wonderful birthday! Your sister has been your support against your parents and your best friend at school. The girl who gave away her hiding places with giggle and forked over her stuffed bear when you cried. She's a wonderful woman, who deserves nothing less than a wonderful birthday. 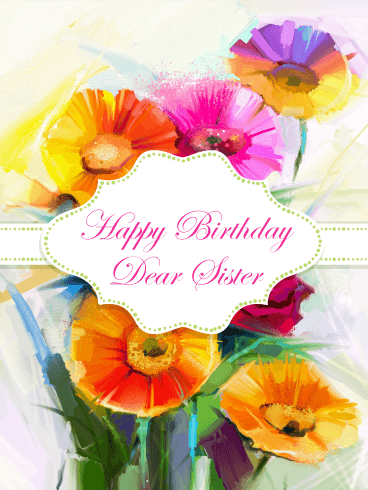 So tell your sister "happy birthday" with this floral card. 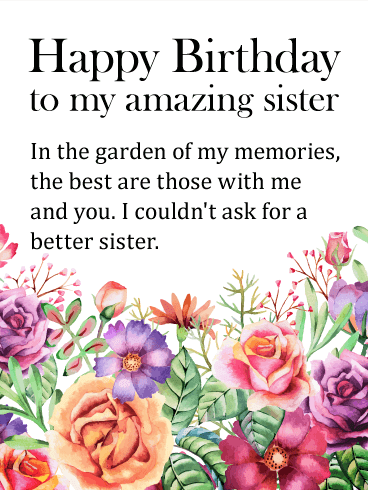 This beautiful birthday card is bright and cheerful, the perfect surprise for your sister as she celebrates her special day. A vibrant blue flower blooming at the center will remind her how much your relationship continues to flourish. And the heartfelt words below wish her joy and happiness in the year ahead. 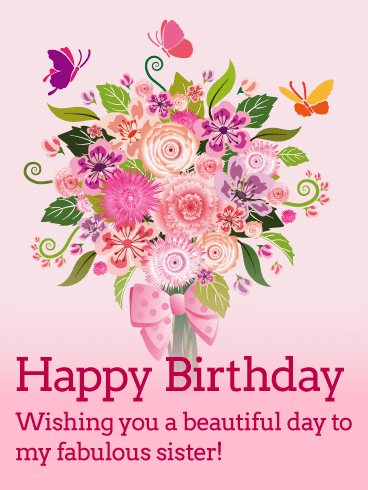 A sweet bouquet surrounded by butterflies brings a lovely touch to this birthday card for your fabulous sister. She's your best friend and someone you care about, so make her feel loved and remembered today by sending her your best and brightest wishes. Even if you can't be there with her, this wonderful birthday card will let her know you're thinking of her always and holding her close to your heart. A sunny sky above and a vibrant garden of flowers below creates the perfect setting for wishing your sister a birthday celebration she'll always remember. The touching words in this birthday card will let her know how much you love her, and that no matter how old you get, the unique bond you share will continue to grow and thrive because of the wonderful person she is! 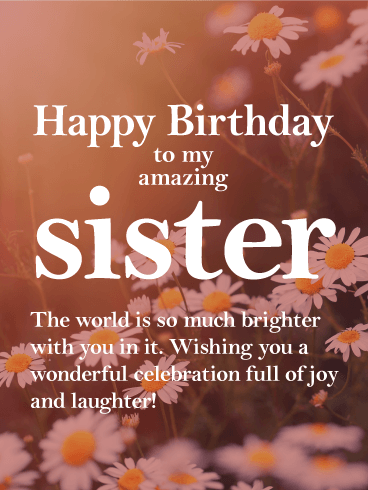 Your sister means so much to you, and her birthday is a wonderful time to let her know. This gorgeous birthday card, featuring sweet daisies in a sunshine-filled field, is such a beautiful and thoughtful way to express what's in your heart, and to wish her a "celebration full of joy and laughter." After all, someone who brightens every day as much as she does deserves to feel special on her big day. There's nothing you want more for your sister on her birthday than for all of her dreams and wishes to come true. This charming birthday card, filled with touching words and a lovely flourish of watercolor flowers, will let her know. She's such an amazing person, who deserves all the happiness in the world, starting with this special day of celebrating with the people she holds most dear. Just take a look at those soft, delicate flowers! This is a birthday card that is elegant without seeming too fancy for your older sister's birthday. It offers the sweet sentiment of love on her birthday, and the gorgeous colors of the flowers are a fabulous touch. You can't go wrong with this card, whether you're five or 95! You can never go wrong with compliments, especially on someone's birthday! After all, who doesn't love a good compliment?! This is a great option for the little sister in your life, especially if she's studious or more of an academic type. The flowers offer a fun element and pop of color, perfect for your sister's birthday in the spring time! Lush roses adorn this beautiful birthday card. Your sister holds a special place in your heart, so why not send a special greeting card her way? A pretty pink birthday card will brighten her day and add a smile to her birthday. She's truly wonderful-she's your sister! 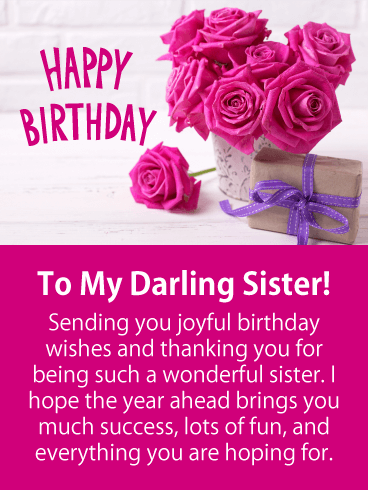 Let her know and send this thoughtful and sweet birthday card for a sister who deserves to a lovely message on her special day. Blue orchids are a symbol of beauty, charm, grace, and strength. They are a beautiful flower for your dear sister on her special day. 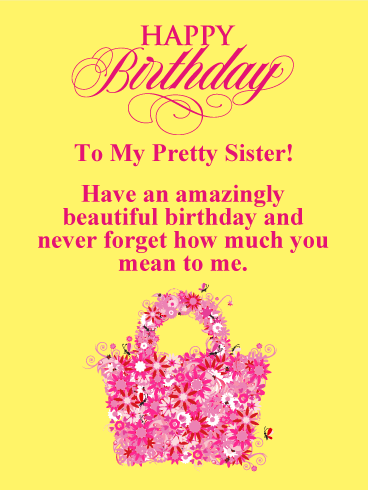 If you don't always know the words to say, but love your sister all the same, this is the card to send. The sincere message will warm her heart and brighten up her birthday. Wish your sister a happy birthday with these lovely blue orchids, delicate and refined, on an elegant birthday card. The gentle stroke of a watercolor brush, and the soft pink of roses bloom on the page. This birthday card for a sister is beautiful and delicate. You and your sister share years of precious memories and share a hope for many more to come. 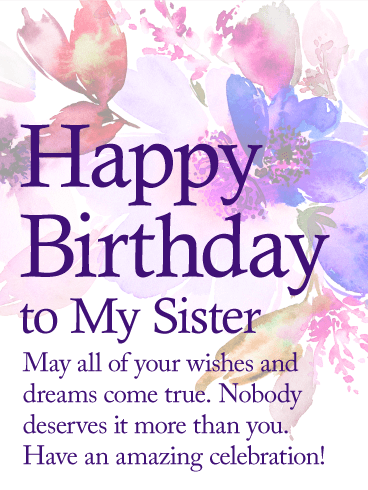 Wish your sister a very happy birthday with this gorgeous birthday card, and thoughtful message. Birthdays come but once a year. Make your sister's birthday beautiful. 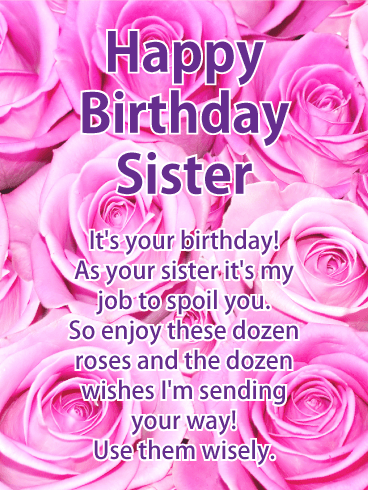 This sincere birthday message comes adorned in pink peonies and red roses to wish your sister a great day. Your sister's life is as lovely as a flower-full of quiet beauty and the strength to bloom where planted. 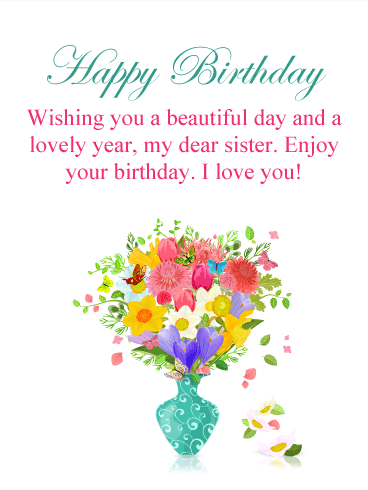 Be sweet and send a charming birthday card to her, your wonderful sister, today. 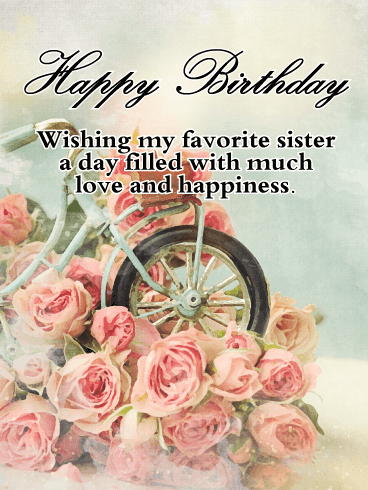 A fabulous card for a fabulous sister! Tell her she is the absolute best with this floral birthday card. These pink blooms are a breath of fresh air and an artistic design for the classy sister. Help her enjoy her special day with a thoughtful and beautiful birthday card. 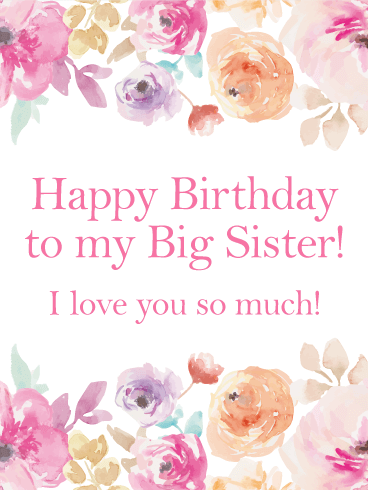 Celebrate your sister's birthday and remind her how much she means to you! Your sister is your best friend, your partner in crime, your shoulder to cry on, and an ear to confide in. You've been through everything together. 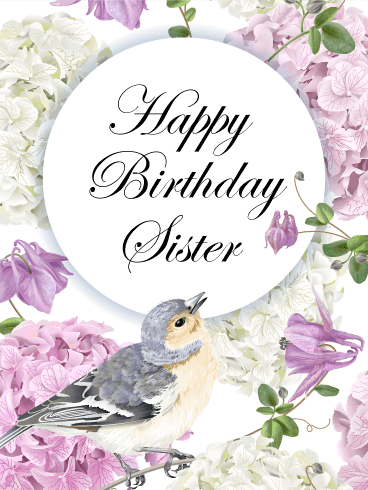 This sweet birthday card for a special sister is elegant, and yet still carefree - just like your relationship! Charming peonies blush in light pinks and surround the sincere birthday message. 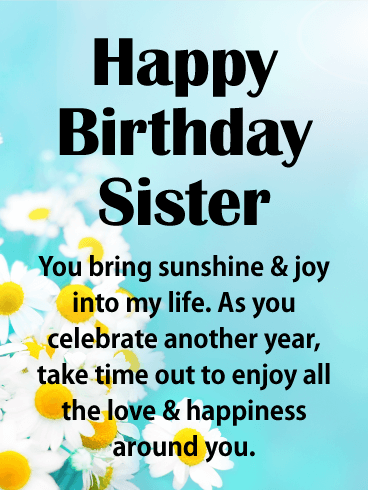 For a day of fun and happiness, send a birthday greeting to your sister that will truly delight her heart and remind her how much you care. For a sweet sister, this birthday card is simply delightful. Polk dots, checks and roses create a timeless feel on this birthday card. 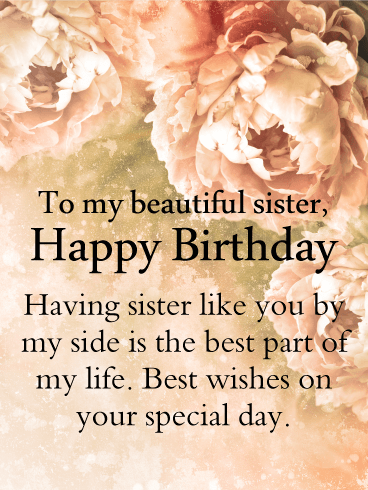 There are so many ways to wish your sister a happy birthday, so why not say it with a heartfelt, beautiful birthday card? Light up her day with this special card. She won't forget your thoughtfulness. It is sure to bring a smile to her lips. 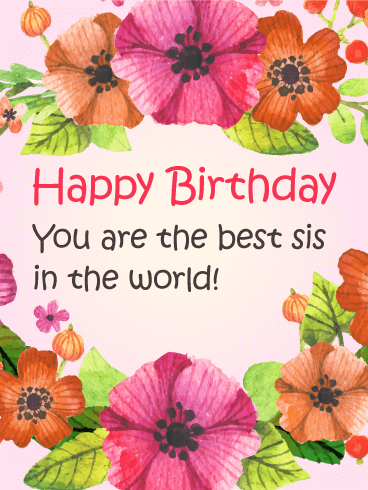 Tell your sister that she is the best with this beautiful birthday card! Luscious pink and orange flowers with bright green leaves will add joy to her special day. The fun and funky font and bright colors are eye-catching and let your sister know you think she is one-of-a-kind.